The story of the Wesley brothers doesn’t end with their deaths. Their influence continues not only in the Methodist denominations (most prominently the United Methodist, Free Methodist, African Methodist Episcopal, Nazarene, and Wesleyan churches), which total some 25 million adherents worldwide, but in the countless lives touched by the hospitals, schools, orphanages, prison ministries, and other tangible expressions of Methodist holiness. To trace the Wesleys’ legacy in today’s sprawling Methodism, Christian History interviewed Tom Oden, a lifelong Methodist and professor of theology at Methodist—founded Drew University in Madison, New Jersey. 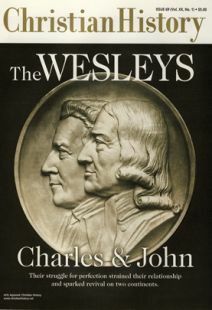 In what ways were John and Charles Wesley products of their times? Both men were deeply rooted in Anglicanism (from their father) and in rigorous Puritan piety (from their mother). They both wanted to experience salvation in its fullness, but the world they lived in did not encourage such a quest for inward and outward holiness. The Anglican Church in the early eighteenth century was self-satisfied and hardly energetic in seeking to live out the gospel. Oxford University, when they were there, was undergoing something of a revival of interest in ancient Christian sources—patristic writings, the Eastern church fathers, the desert monastics—that centered on the search for holy life. Rather than see this as an academic exercise, the Wesleys took it personally. In the Holy Club, he founded what we’d call a support group for those who wanted to pursue holy living—not merely private piety but public acts of charity and service. John Wesley never saw himself as an innovator. He was just taking seriously what the church said it believed. He was just actualizing the tradition. How did the movement change after the deaths of its founders? The Methodist movement quickly became identified with the holiness revival tradition and the camp meeting movement, which focused on gospel preaching and a quest for holiness informed by grace. The Holy Spirit was expected to enter a person’s heart and transform life in both its private and public aspects. At the same time, Methodists were ministering to orphans and prisoners, making loans, and in the 1840s, establishing the beginnings of world missions. By 1840 the Methodist Episcopal Church, with 580,098 members, was the largest denomination in America. The emphasis on both inward and outward holiness continued until end of nineteenth century. At turn of twentieth century, Methodism, like many other denominations, began adapting to a progressive and liberal view of social change. Philosophic idealism and the social gospel movement had a secularizing effect. Many Methodist bishops were trained at Boston University and were influenced by “Boston personalism,” which led to a more humanistic outlook among the denomination’s leaders, even as the grassroots remained pietistic. What caused the splits in the U. S. movement? During the American Revolution, Methodist pastors here identified with the revolution. Many Anglican clergy fled to Canada or England. So the Methodists in the United States clearly broke from the Church of England. Wesley saw it happening and reluctantly gave his blessing. The Anglican church dissolved in North America, leaving the Methodist Episcopal Church. The Methodist societies in Ireland and England didn’t split as quickly, but after Wesley’s death, they too eventually broke away. In 1816 the African Methodist Episcopal Church was formed with the support of Francis Asbury, who consecrated Richard Allen as first bishop of the new church. In 1843, the Wesleyan Methodist Church split off to protest the toleration of slavery by the Methodist Episcopal Church. A year later, largely over the same issue, the Methodist Episcopal Church split into the Methodist Church and the Methodist Church South. Southern Methodist University’s name reflects this. The north’s counterparts were schools such as Syracuse, Northwestern, Drew, and Boston University. The Free Methodist Church was formed in 1860 over the issues of free pews (not rented), freedom for slaves, and free worship. In 1939 the northern and southern churches reunited as the Methodist Church, and in 1968 this group merged with the Evangelical United Brethren to form the United Methodist Church. In what ways is today’s Methodist church a continuation of the Wesleys’ movement? Today there’s a modest but significant refocusing of Wesleyan influence. At the 1988 Methodist General Conference, doctrinal standards were more sharply defined. Wesley’s Standard Sermons, his Explanatory Notes on the New Testament, and his 25 Articles of Religion were affirmed as foundational. Of course, different groups emphasize different things. Liberals emphasize Wesley’s social concern—his opposition to slavery and his championing of the poor. Conservatives focus on sanctificationist themes that enable social action to be viable. What would John Wesley not recognize in today’s Methodism? The huge bureaucracy of the United Methodist Church. I say this because John Wesley was clearly dismayed when Thomas Coke and Francis Asbury began referring to themselves as “bishops.” Wesley’s Methodism was focused on teaching, accountability, acts of service, caring for the poor and orphans and prisoners and others in need. In his sermon “The Lord’s Vineyard,” Wesley describes the Lord’s vineyard as overgrown with weeds. At end of his life, he’s already despairing that his movement is becoming another institution. He also wouldn’t recognize the vast and independent executive branch of the United Methodist Church, which is supposed to carry out the will of the General Conference, but now is directing its own way. Because of the enormous endowments accumulated over the years, the headquarters is not strictly accountable to the will of the congregations. So church agencies find ways to speak apart from the will of the General Conference, for instance, on partial-birth abortion. The stress today in the United Methodist church is the issue of accountability. Early in Methodism, Thomas Coke championed global missions. What has happened to that vision? In the UMC, the General Board of Global Ministry has $500 million in assets. If you talk to those on the board, they’ll mention their concerns for evangelism and preaching, yet the percentage of missionaries focused on these areas is small. The real energy is in social-action projects—digging wells and building schools, hospitals, and such. The endowment is large enough that the board doesn’t need to be too attentive to the preferences of congregations or even bishops. In recent years, the board has been criticized for its anti-American, anti-capitalism, pro-gay agenda. In Central America, it was clearly identified with liberation theology and visibly supported the Sandinista regime in Nicaragua. Recently, an alternative mission organization called the Missionary Society has been established, and this group is already sending more preaching pastors abroad than the Board of Global Ministry. How is Methodism worldwide different from the American brand? In Africa and Asia, especially, Methodism is more doctrinally centered on salvation by grace through faith and seeking the holy life. Even in British Methodism, the doctrinal focus is stronger—Wesleyan hymns and piety are more prominent. And Methodism has long been associated with the Labor Party (Margaret Thatcher—a Methodist and a member of the Conservative Party—being a notable exception). In India in 1870, Methodist bishop William Taylor developed a self-supporting, self-determining church. This concept of an indigenous church not dependent on outside funding eventually moved to China and developed into what’s known today as the Three—Self Church. What is the relationship between the Methodist, holiness, Pentecostal, and charismatic movements? Until the 1880s, the holiness movement was essentially strong Wesleyan teaching on sanctification. Holiness preaching also affected some Presbyterian, Congregational, and Quaker groups. In effect, it was an ecumenical revivalist movement. The movement split in the late 1800s as some argued for entire sanctification as a definite and distinct “second blessing” subsequent to conversion. This produced Nazarene and holiness churches. Pentecostals shared that emphasis but added a focus on glossolalia. The charismatic movement has influenced Methodism much as it has Anglicanism and Catholicism. Most charismatics wouldn’t think of themselves as following a Wesleyan emphasis but simply following the Holy Spirit. Is there a conscious effort now to recover the legacy of John Wesley? Within the UMC are 12 renewing movements, all committed to recovery of Wesley’s emphases. The Good News movement has been a voice for reform for 30 years. In the last six years, the Confessing Movement, a grassroots lay movement of half a million people, has emerged for the renewal of doctrinal integrity. What has been the Wesleys’ most significant contribution? The recovery of ancient ecumenical teaching and the focus on small group accountability, grounded in scriptural study and prayer, attentive to social responsibility. These priorities weren’t unique to their movement, but they were more intensified than in many others. The Wesleys were considered radical because they took so seriously the faith and the ethical responsibilities that they considered incumbent on all Christians.